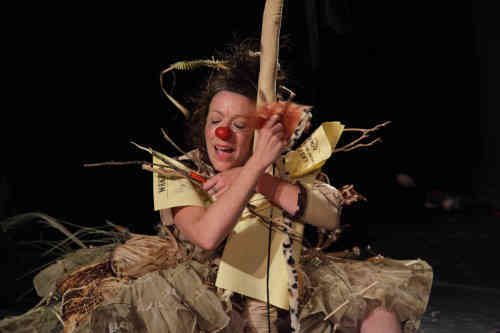 Wanted, produced by Guayoyo Creative Collective, is a one-woman clown show playing at the Toronto Fringe Festival. Although Mélanie Raymond offers an energetic performance, I thought the uneven tone and (in my opinion) problematic echoes of this play made it difficult to enjoy. Wanted has a simple premise: a “cat lady” has lost her cat. I place “cat lady” in quotation marks because it is, in my opinion, a sexist label designed to shame unmarried women. This is part of the reason I was personally disappointed to see this term used and depicted uncritically. With that said, Raymond is a very good performer; when she broke that first branch off the tree in the park, her reaction was so convincing that I was genuinely unsure whether it had been an accident. The sequence with the broken tree was very funny and the audience greatly enjoyed it. The ending section of Wanted—when Raymond came out into the audience to practice her human interactions—was my favourite part of the play. I finally felt emotionally connected to Raymond’s character because I understood her newfound desire to fit in. I was also impressed by the craftsmanship of her elaborate costume, which included a bouncy crinoline skirt. Unfortunately, the colour and layered feel of the costume evoked—in a stylized way—the clothing of a homeless person in a way that made me uncomfortable. The lack of context for Raymond ‘s character made it feel like her whole world consisted of the section of park depicted onstage, which only added to this association. To me, Wanted frequently edged into inappropriate territory. The way Raymond’s character talked to trees and other inanimate objects was perhaps intended to be whimsical, but given her desperate loneliness and inner darkness (“I destroy people close to me”), it evoked mental illness too strongly for my taste. Overall, I thought Wanted suffered from an unevenness in its tone. Throughout the play, I couldn’t decide whether I was meant to sympathize with Raymond’s character or to have a laugh at her expense. And what would it have meant to laugh, given the shadow of homelessness and mental illness that I couldn’t shake off?